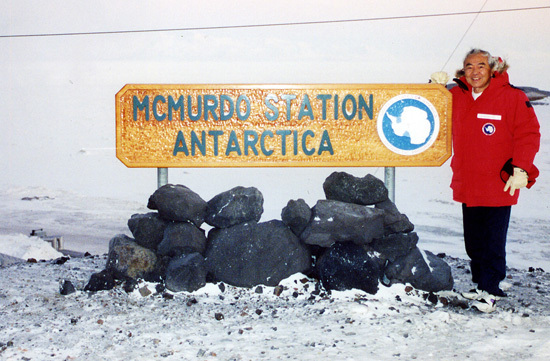 George Iwanaga, an aerospace engineer, visits the McMurdo Station in Antarctica. A ground station was dedicated to Iwanaga on Dec. 5, 2011. 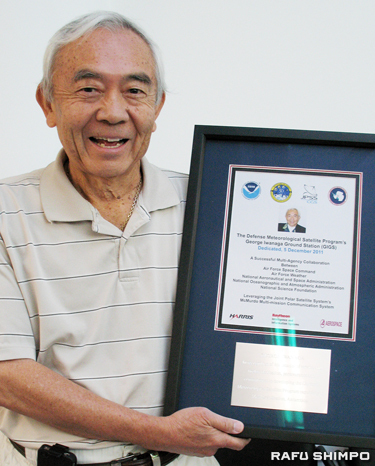 The McMurdo Antarctic project developed from an engineering idea into reality thanks in large part to the hard work and dedication provided by one individual, Aerospace Corporation engineer George Iwanaga. He began investigating the viability of an Antarctic ground site in the early 1990s as part of an upgrade initiative and maintained his advocacy throughout the decades. The effort culminated with a ground station, located at McMurdo Station research center on Ross Island, Antarctica, and was officially named “GIGS” for George Iwanaga Ground Station. Iwanaga worked for 43 years in the space and missile business. He received his BS in engineering from UC Berkeley and an MS in engineering from USC. He and his wife, Jane, have four sons and five grandchildren. Iwanaga is a volunteer with the Asia American Symphony Association and also volunteers in prison ministry at Twin Towers L.A. County. All remote ground stations are designated by four-letter identifiers, often acronyms. This ground station receives environmental terrestrial and space weather data collected globally on-board orbiting civilian, military, and foreign satellites. This data is provided to users without artificial delays to customers worldwide. A sample of weather products includes hurricane, typhoon and tornado tracking, soil moisture, severe weather forecasting, solar flare intensity disrupting worldwide communication, and aviation routing, to name a few supporting roles this remote station provides. GIGS reached its initial operational capability (IOC) in March. An identical plaque now resides permanently on equipment in the Joint Satellite Operations Center at McMurdo. Wow, George!! Congratulations! Now I see the “other” side of you…. great to know! Thank you for all your years of dedication to a product that will service mankind for generations to come. How many people can say that about their lives?